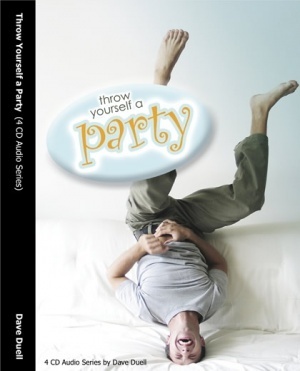 Throw yourself a party by Dave Duell is a book for everyone. ” How do you react when things don’t go your way? In this insightful book, you will learn biblical principles for dealing with difficult situations. As you discover these living truths from God’s Word, you will be refreshed in your spirit and set on a new course of victory over life’s challenges. I have had the privilege of hearing Dave in person and his writing style is as easy as his speaking style. If you are in a hard place, this book is for you! If you’re not, read it and prepare! Very encouraging, uplifting and inspirational! I give this book 5+ stars. Recommended for pre-teens and up. This entry was posted in Book Reviews and tagged book, book review, Christ, christian, Dave Duell, Dave Duell Ministries, depression, disapointment, discouragement, faith, Faith Ministries, God, good read, hard times, Holy Spirit, hope, inspirational, Jesus, must read, non-fiction, Religion and Spirituality, review, rough times, scriptures, suicide.